Humanity travels more than ever before, not only in terms of vacations but also on a daily basis. A very great percentage of workers utilize a car as their form of transportation every single day. Many companies depend on vehicles like cars and trucks in order to carry out their operations. Just look at some of the biggest companies like Amazon, vehicles are an absolute necessity for them. However, current measures are not always efficient or as profitable as they can be. When companies like Amazon have such high turnover rates, every single penny saved equates to millions of dollars each year, which is why companies always are on the lookout for new and innovative technology. One of the solutions to the transport and logistics industry is the use of drones. This solution comes with a range of benefits, including lower operational costs, which is exactly what companies want. At the moment, this solution is just being explored by the industry, it is not yet fully in use. Some of the reasons why it still isn’t being fully used are that management of these drones isn’t optimized in a network and that drones aren’t developed to meet the need of the industry. A project that aims to change this, is Deep Aero. They are creating an ecosystem for drones and drone services built on blockchain, powered by AI technology. Drones obviously have a ton of potential to improve the logistics industry. Companies can use drones to ship out products, even big cargos. Making a drone fly to a destination is cheaper than using a truck because it doesn’t require any human operator, isn’t limited by traffic or constructing issues, it simply just flies through the air. But even though there is a huge market for drones in a business-oriented sense, Deep Aero wants to give everyone access to drone services. The most exciting of these is drone taxis. Yes, you will literally be able to order a drone just like a taxi and get it to fly you to your desired destination. A truly futuristic like experience. Everything will be offered on the same platform, whether you want to order drone parts, order a parcel service, a drone taxi or something else. 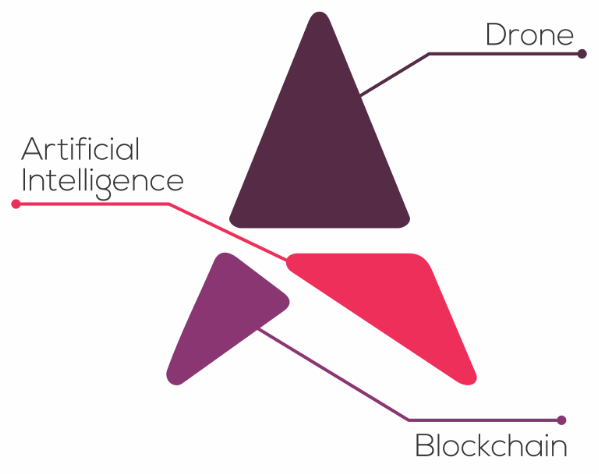 The entire drone platform will be using Deep Aero’s own token, the DRONE token.